It’s October (finally!) and I’m getting prepped mentally for the infamous “October Slide” with POTS. For some reason, people with dysautonomia see a worsening of symptoms during the fall. 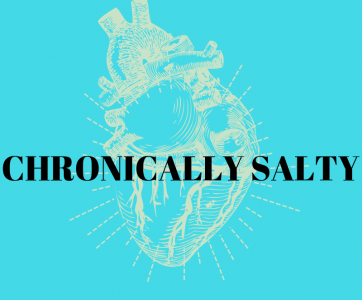 So far for Chronically Salty, I have posted about tips and tricks to living life with chronic illness with articles about proper compression gear, navigating emergency rooms, and keeping cool in the summer. But what do I do mentally to help me cope with having a chronic illness? The summer in the south seems to be lingering on forever and I haven’t been able to spend more than a few minutes outside in months because of the heat. It’s during these months that I miss enjoying sitting on the beach, eating ice creams outside, and long hikes. It is now October and is about 24 weeks that I have been stuck inside and somehow I am just now starting to get cabin fever. I feel like having POTS in North Carolina is the ultimate mental challenge: you can’t go anywhere without AC and you can’t move too much because of the humidity. So what do you do to pass time and not go insane? I am a scientist-type person, not an artist, but music has always been a special mental health remedy for me. Although this song is obviously about his lover, I think of it also as letting go of my old self before POTS and trying to decide what really is important to me about myself. What can I rely on about myself and what will change and say goodbye? I interpret When the End Comes to be about priorities. Even when we are having a bad day, is that what we want to remember these days by? While this song is originally more about a mother/son relationship, I think it can be applicable in the context of freeing yourself from your illness and becoming independent from it, if only in the space of your own mind. I went to a couples/marriage counselor who typically works with couples in which one partner has a chronic illness. His question was always, “how much room are you giving POTS in your relationship/life?” Mentally, we can give our illnesses any amount of space we want, so why was I letting POTS take over my life? If I am going to have dysautonomia for the rest of my life, I definitely do not want POTS to define me. I’d rather be the autonomic specialist who just so happens to have POTS than that “POTS woman.” I can never control how much POTS will have an affect on my physically, but I can mentally. It may be very difficult to take control mentally, but I think practicing this mindfulness is as important as any medicine. Empty is definitely a darker song, but I really like it. I believe that this song is about depression and those with chronic illnesses are more vulnerable to depression than their “healthy” counterparts. A lot of people always ask me how I am still so positive and happy despite having to deal with disabling symptoms of dysautonomia. No one is happy 100% of the time, even if life is going perfectly for them. I don’t think happiness comes without work, I think you have to choose to be happy and for some people, that is harder to do for a variety of reasons. I definitely never learned to count my blessings (like REALLY think about them) before getting POTS. Since becoming sick, I have had to rethink my priorities and what is most meaningful to me in life. I don’t have the energy to hold onto every emotion, so being sick sometimes has actually been freeing for me emotionally. However, I definitely still have my low days– and that’s OK. Everyone you read about on social media that says they are happy or choosing joy isn’t naturally happy 100% of the time, but they are CHOOSING to adapt a positive and happy mindset. That doesn’t mean that they don’t have self-doubts, anxieties, or dark days, it just means that they are choosing to emphasize the better moments. An oldie for you here. Don’t Stop is a Fleetwood Mac classic that anyone who is having a rough day should listen to. Sometimes we are so stuck in the “illness” mindset that we just really need some new perspective. So take a minute and listen to this song with your eyes closed, then open your eyes and take a good look at what’s outside you. Sometimes we just need a little bit of pause to get back into a better mindset and sometimes, we just have to remind ourselves that this is only one day. We got this! Check out my playlist on Spotify that I’ll be adding to every month.